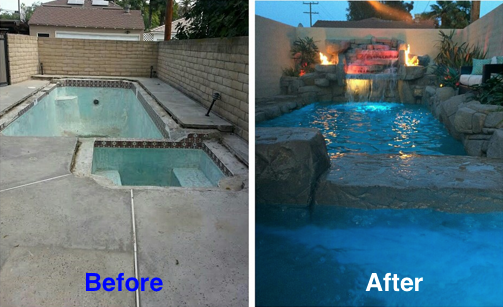 In this “once dated” backyard, Coastline took this 1970’s pool and transformed it into a beautiful and functional paradise getaway! In just around 8 short weeks the skilled Coastline crew not only gutted the existing pool, replacing all internal equipment and plumbing, they also completely modernized the entire space. After installing completely new machinery, they then added an up to date rock formation with water falls, not only able to mask any mechanical sounds or loud neighbors but also creates a peaceful and calming atmosphere for the home owners to escape to anytime. Final touches included a fresh new pool decking using brand new pavers (a smart choice as they are removable for future plumbing or electrical maintenance and repairs), and finally no backyard get-away is complete without a gorgeous and exciting fire feature with seating and an LED light system displaying dreamy and exotic colors in the pools water. What a luxurious outdoor living space! Don’t Hesitate to find out what it would cost to transform your space. Call us today at 562-425-6958 or Contact Us.